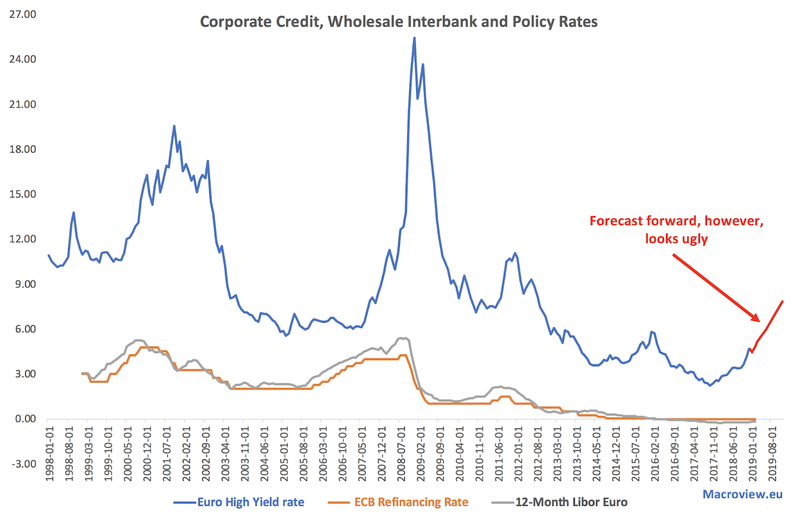 Since the start of the Global Financial Crisis (GFC) and through subsequent Euro area crises, the EU frameworks for reforming financial services have invariably been anchored to the need for reducing the extent of systemic risks in European banking. 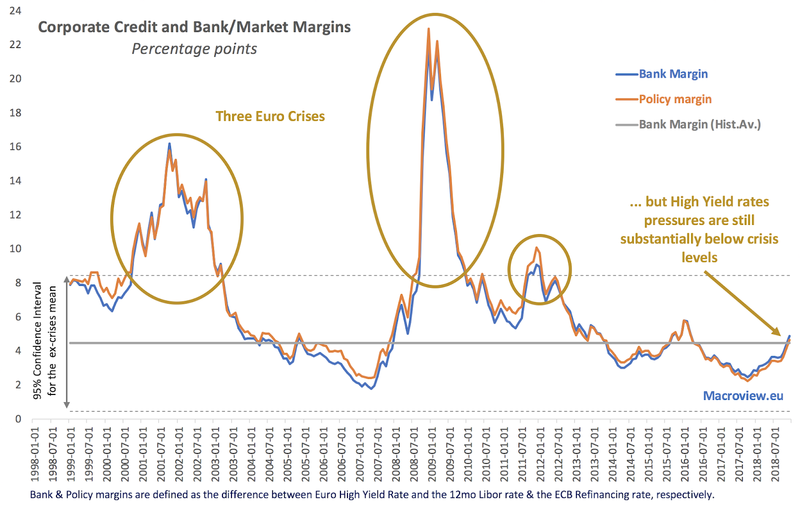 While it is patently clear that Euro area's participation in the GFC has been based on the same meme of 'too big to fail' TBTF banks creating a toxic contagion channel from banks balance sheets to the real economy and the sovereigns, what has been less discussed in the context of the subsequent reforms is the degree of competition within European banking sector. So much so, that the Euro area statistical boffins even stopped reporting banking sector concentration indices for the entire Euro area (although they did continue reporting the same for individual member states). 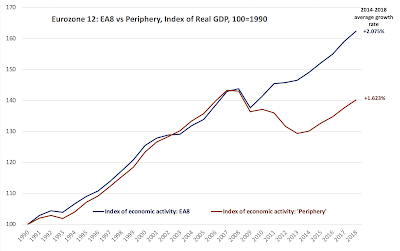 Chart below plots weighted average Herfindahl Index for the EA12 original Euro area states, with each country nominal GDP being used as a weight. In terms of total assets, concentration of market power within the hands of larger TBFT banks has stayed virtually unchanged across the EA12 between 2009 and 2017. Herfindahl Index for total assets was 0.3249 in 2009 and it is was at 0.3239 in 2017. Statistically-speaking, there has been no meaningful changes in assets concentration in TBTF banks across the EA12 since 2003. 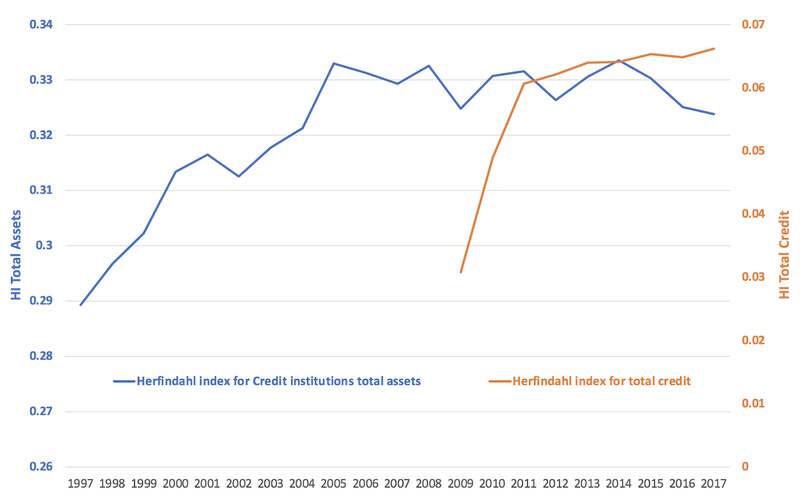 In terms of total credit issued within the EA12, Herfindahl Index shows a rather pronounced trend up. 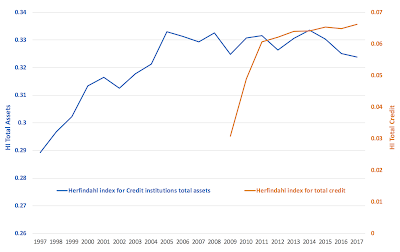 In 2010 (the first year for which consistent data is provided), Herfindahl Index for total credit shows 0.0602 reading, which rose to 0.0662 in 2017. 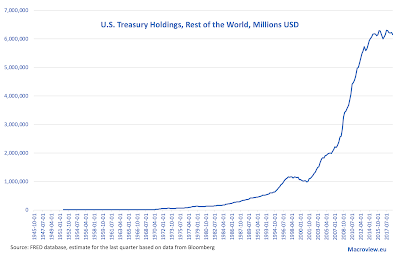 Put simply, TBTF banks are getting ever bigger. 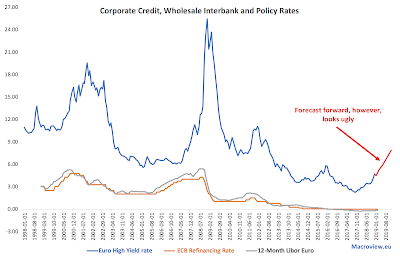 With them, the risks of contagion from the banking sector to the real economy and the sovereigns remain unabated, no matter how many 'green papers' on reforms the EU issues, and no matter how many systemic risk agencies Brussels creates. 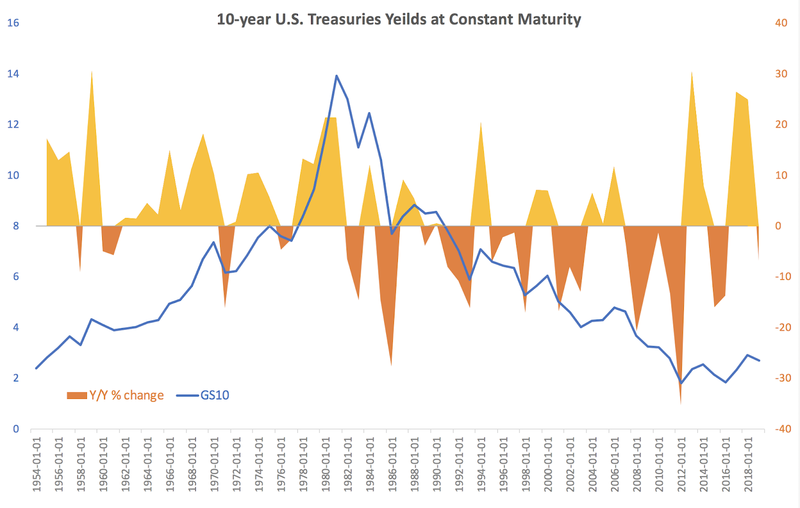 That is a bit more testing than the current above-the-average yields. 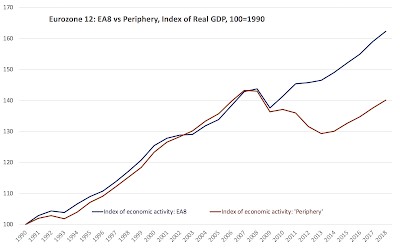 A promise of economic convergence was one of the core reasons behind the creation of the Euro. At no time in the Euro area history has this promise been more important than in the years following the series of the 2008-2013 crises, primarily because the crisis has significantly adversely impacted not only the 'new member states' (who may or may not have been on the 'convergence path' prior to the crisis onset), but also the 'old member states' (who were supposed to have been on the convergence path prior to the crisis). 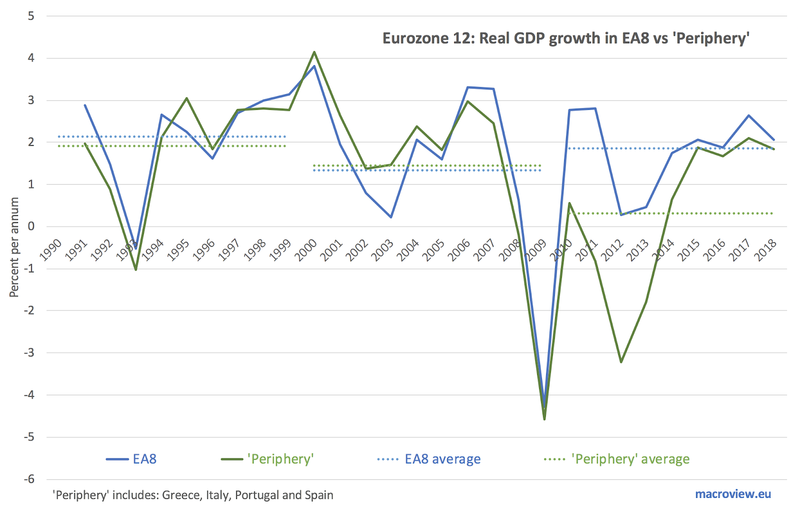 The latter group of states is the so-called Euro periphery: Greece, Italy, Spain and Portugal. 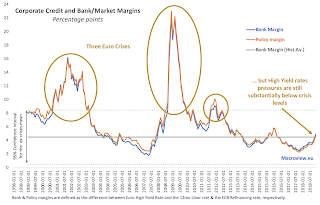 So have the Euro delivered convergence for these states since the end of the Euro area crises, starting with 2014? The answer is firmly 'No'. The chart above clearly shows that since the onset of the 'recovery', Euro area 8 states (EA12 ex-periphery) averaged a growth rate of just under 2.075 percent per annum. The 'peripheral' states growth rate averaged just 1.623 percent per annum. In simple terms, recovery in the Euro area between 2014 and 2018 has been associated with continued divergence in the EA4 states. 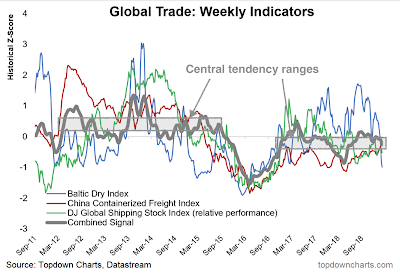 This is hardly surprising, as shown in the chart above. 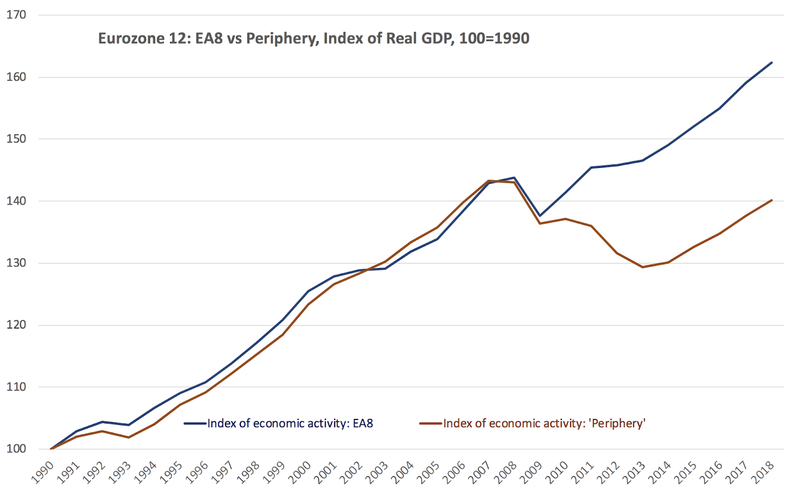 Even during the so-called 'boom' period, peripheral states average growth rates were statistically indistinguishable from those of the EA8. 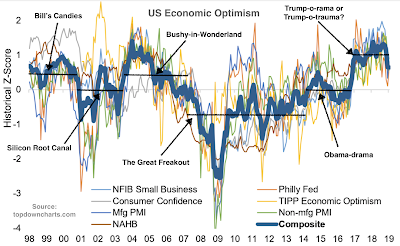 Which implies no meaningful evidence of convergence during the 'good times'. 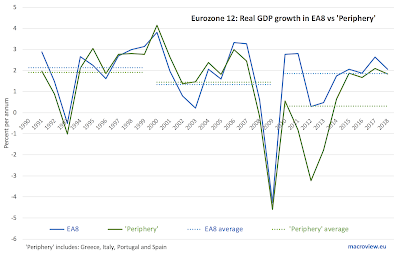 The picture dramatically changed starting with 2009, starting the period of severe divergence between the EA8 and EA4. 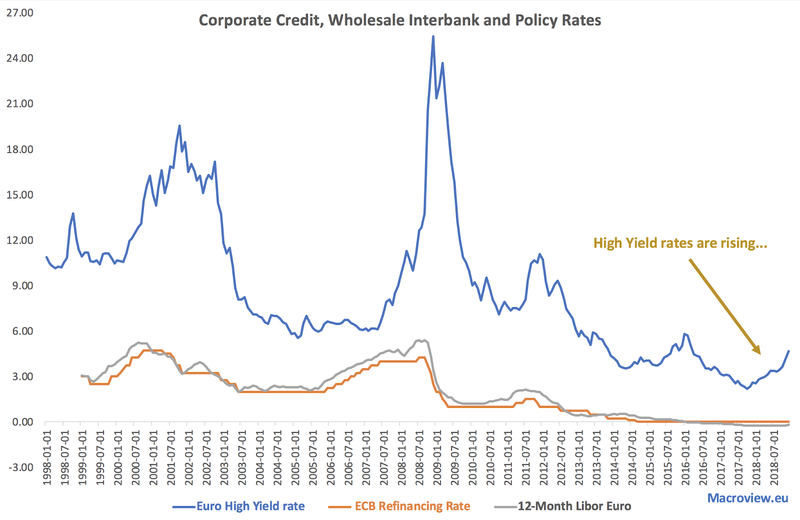 In simple terms, the idea that the common currency has been delivering on its core promise of facilitating economic convergence between the rich Euro area states and the less prosperous ones holds no water. 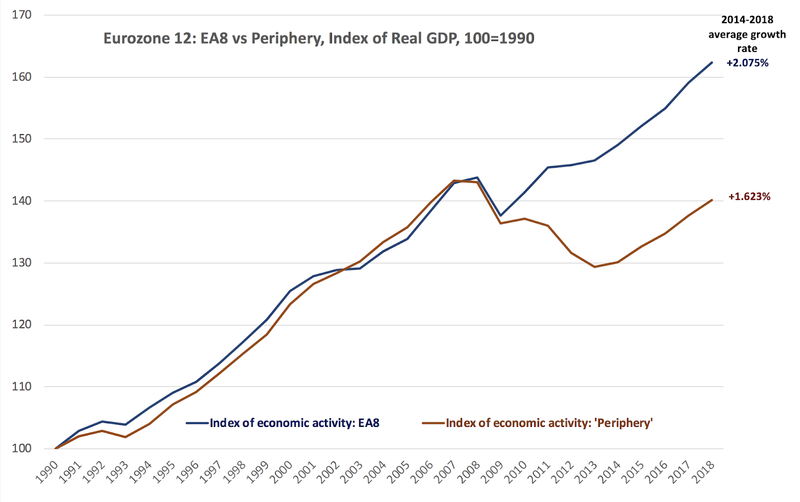 Just another reminder why productivity growth is not being aided by cheap credit. In summary: "This transaction was unwound in 2016 as part of the closure of our Non-Core Operations", according to the spokeswoman email to the WSJ. 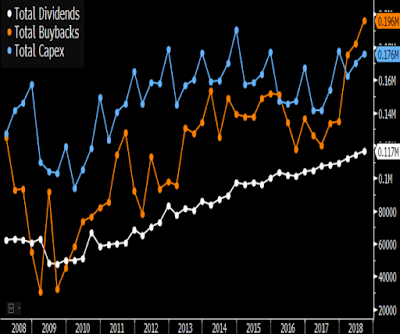 DB ca $7.8 billion portfolio of 500 municipal bonds back in 2007. The bonds were insured by specialised mono-line insurers to protect against default. In March of 2008, the bank followed up the trade by buying additional default protection from Berkshire Hathaway for $140 million. Insure-and-forget, right?By the end of 2011, the bank had a little over $115 million of reserves set aside to cover potential losses on the trade. That figure rose to over $1 billion at the start of 2016. By May 2016, the bank calculated an additional loss of $728-$768 million on a potential sale of the portfolio net of the loss protection from Berkshire. Per WSJ, this loss - previously unreported - amounts to ca x4 times DB's 2018 profits. 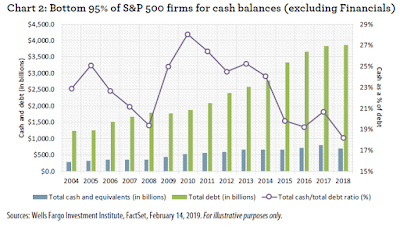 Firstly, as @Lisaabramowicz correctly summarises: "American companies look cash-rich on paper, but average leverage ratios don't tell the story. 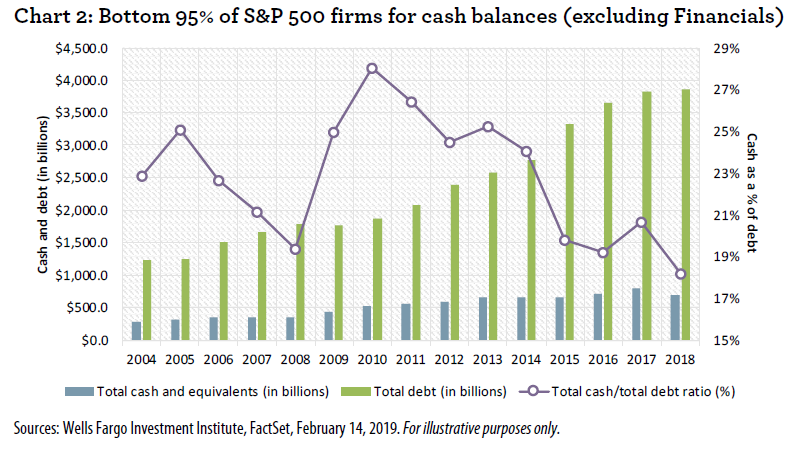 5% of S&P 500 companies hold more than half the overall cash; the other 95% of corporations have cash-to-debt levels that are the lowest in data going back to 2004". 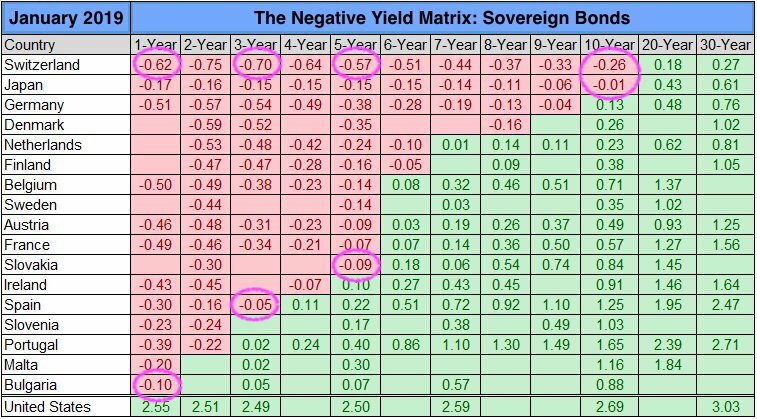 Which is the happy outrun of the Fed and rest of the CBs' exercises in Quantitive Hosing of the economies with cheap credit over the recent years. 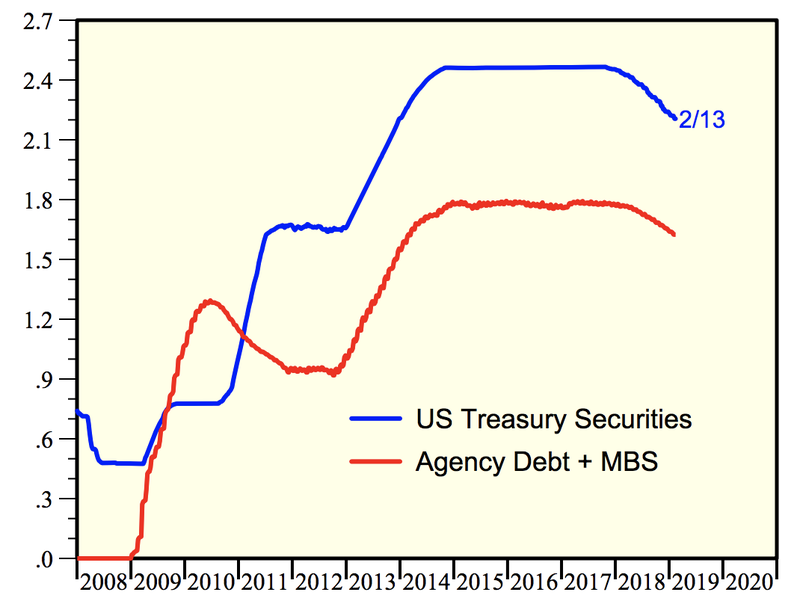 So much 'excessive' it hurts: a 1 percentage point climb in corporate debt yields, over the medium term (3-5 years) will shave off almost USD40 billion in annual EBITDA, although tax shields on that debt are likely to siphon off some of this pain to the Federal deficits. 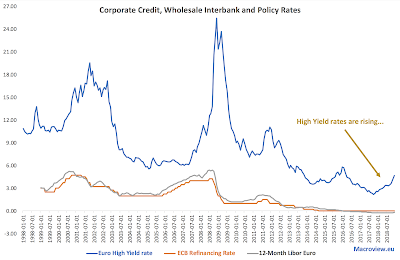 Secondly, this pile up of corporate debt has come with little 'balancesheet rebuilding' or 'resilience to shocks' capacity. 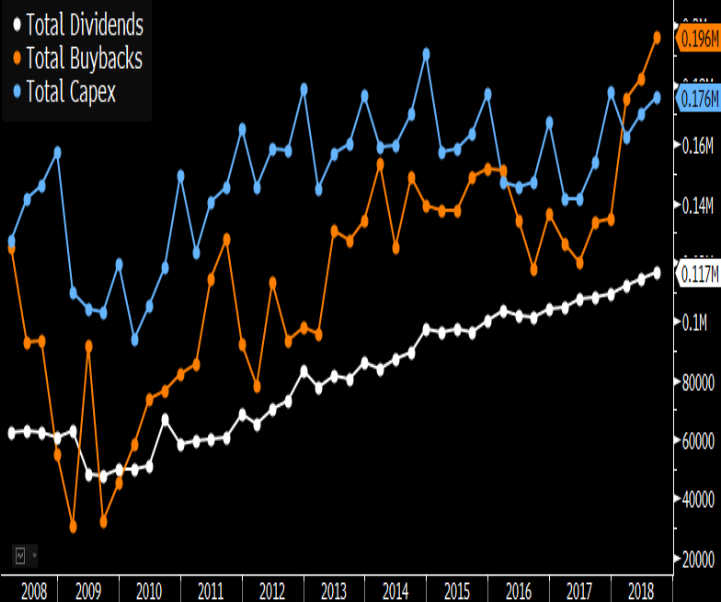 Much of the debt uptake in recent years has been squandered by corporates on dividend finance and stock repurchases, superficially boosting the book value and the market value of the companies involved, without improving their future cash flows. And, to add to that pain, without improving future growth prospects. The latest Labour Force Survey for 4Q 2018 for Ireland, published by CSO, shows some decent employment increases over 2018, and a welcomed, but shallow, rise in the labour force participation rates. Alongside with a decrease (over FY 2018) in the headline unemployment rate, these are welcome changes, consistent with overall economic growth picture for the state. One, much less-reported in the media, set of metrics for labour markets performance is the set of broader unemployment measures provided by the CSO. These are known as Potential Labour Supply stats (PLS1-PLS4). The measures also show improvements over 2018, just in line with overall employment growth. 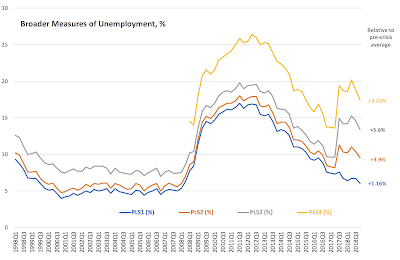 However, these measures clearly indicate that after 11 years running, the 2008-2014 crises remain still evident in the labour force statistics for Ireland. Note: Increase in PLS2-PLS4 series at 3Q 2017 is down to change in assessment methodology under the LFS replacing QNHS, with data pre-3Q 2017 adjusted to reflect that change by the CSO. PLS1 adds discouraged workers. These are individuals who are out of work but who have become disillusioned with job search. PLS2 includes all individuals in Potential Additional Labour Force (PALF). The PALF is made up of two groups: persons seeking work but not immediately available and persons available to work but not seeking, of which discouraged workers make up the largest number. PLS3 includes all those in the previous two categories (PLS1 and PLS2) along with persons outside the labour force but not in education or training. PLS4 is the broadest measure of unemployment or potential labour supply and is calculated by adding part-time underemployed workers to PLS3. Part-time underemployed workers are individuals currently working part time who are willing and available to work additional hours. The broadest measure of unemployment (PLS4) stood at 13.7 per cent in 4Q 2016. At 4Q 2017 it was 18.7 per cent and by 4Q 2018 it was down to 17.5 per cent. 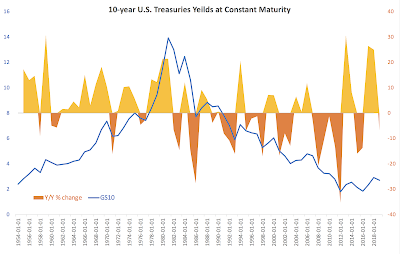 In recent months, I have been warning about the cliff of new bonds issuance that is coming for the U.S. Treasuries in 2019, pressured by the declining interest in U.S. debt from the rest of the world. 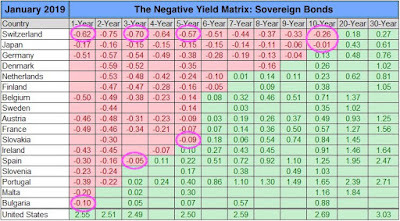 December 2018 figures are a further signal reinforcing the importance of this warning (see U.S. yields comparatives here: http://trueeconomics.blogspot.com/2019/02/15219-still-drowning-in-love-for-debt.html). 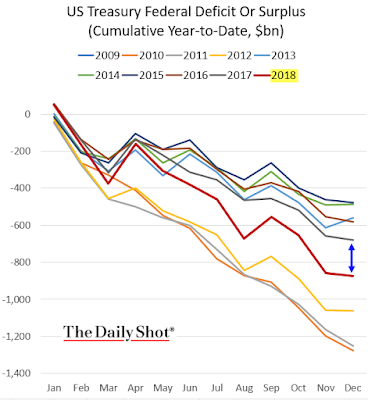 In December 2018, foreign buyers cut back their purchases of the U.S. Treasuries by the net USD77.35 billion, following a net increase in purchases in November of USD13.2 billion. December net outflow was the largest since January 1978. On a positive note, Chinese holdings of U.S. Treasuries increased in December, after declining for six straight months. China held USD1.123 trillion in U.S. Treasuries in December, up from USD1.121 trillion in November. 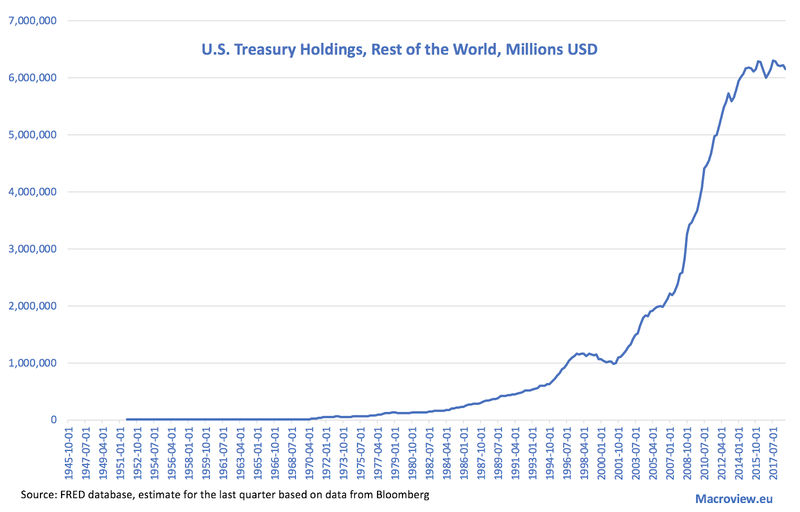 Not quite an armageddon, but statistically, foreign holdings of the U.S. Treasuries remained basically flat from 1Q 2014. 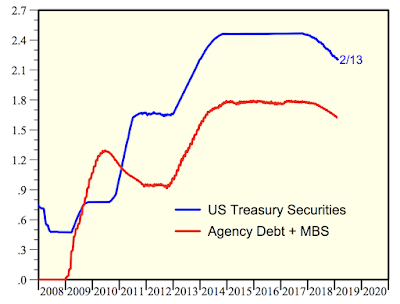 Which would be fine, if (1) U.S. new net issuance was to remain at zero or close to it (which is not the case with accelerating deficits: http://trueeconomics.blogspot.com/2019/02/15219-nothing-to-worry-about-for-those.html), (2) U.S. Fed was not 'normalizing' its asset holdings (which is not the case, as the Fed continues to reduce its balance sheet - see next chart). Venezuela's economic (and political, social, public, etc) woes have been documented with exhaustion, although no one so far has produced a half-meaningful outline of solutions that are feasible and effective at the same time. What is, however, remarkable in this exposition, is not Venezuela's demise, which is impressive, but the experience of Russia and the contrasting experience of Ukraine in post-Soviet collapse era. 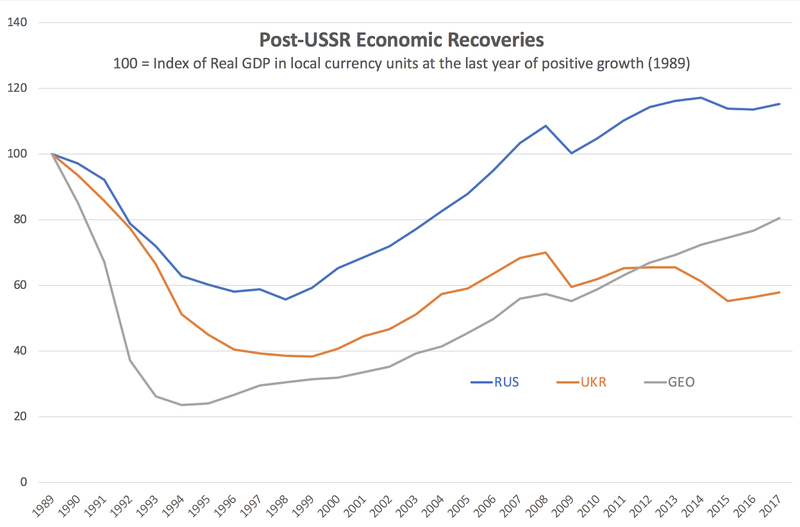 You don't need to have a PhD in economics to comprehend the chart above in political terms: like it or not, the Western 'policies prescriptions' have not been a great source of optimism for Georgia, Ukraine and Russia in the 1990s. It hasn't been a great source of optimism for Georgia in the 2000s, and it hasn't been of much use for Ukraine since 2014. In part, the reason is that the Western prescriptions for policy development and reforms were not exactly followed by these countries in the past, and in part, these prescriptions were not suitable to these economies and their societies. But, also in part, the reason as to why Western reforms did not work their magic in the three former-USSR states is that they were never accompanied by the genuine buy-in from the West. There was no 'great trade' opening, no 'structural FDI rush', no 'Marshall Plan supports'. What little tangible support was extended to these countries (and other post-Soviet states) from the West was largely siphoned off into the pockets of the Western contractors and domestic oligarchs. Russian recovery 'miracle' that is traceable above was down to the removal of the Western contractors from the proverbial feeding trough, and consolidation of domestic oligarchs and corrupt elites. One can't call these changes 'liberal' or 'reforms', but they were successful while they lasted (through 2014). 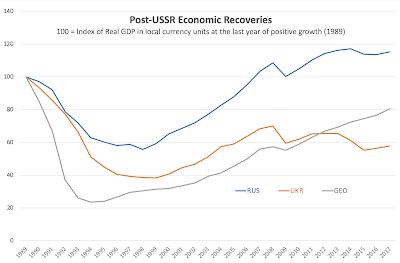 What is also telling is that the rates of recovery - at peak rates - in Georgia (during the hey-days of Western-style reforms) were not quite comparable with the same rate of Russian economic recovery. And that is before one considers the peak recovery in Ukraine since 2014. 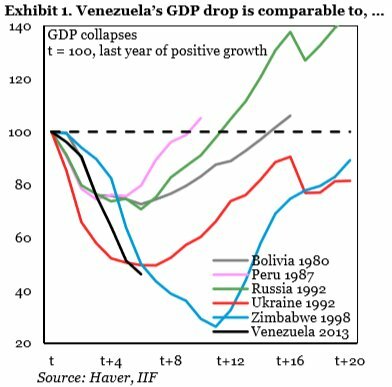 Incidentally, returning to the IIF chart above, neither Peru (it took the country 8 years to recover from its 1989 crisis) nor Bolivia (same duration for its crisis of 1982) compare to the cases of the post-USSR collapse crises in magnitude and recovery duration. Zimbabwe does, and it recovered from its 1998-started economic collapse in 18 years, by the end of 2017). Last time I checked, Zimbabwe also did not follow the Western 'prescriptions' in its policies path, and still beats Georgia and Ukraine in terms of its experience (both former USSR states are now in year 28 of post-1989 economic crisis). or put differently: 13 years of 'ugly', 8 years of 'euphoric'. 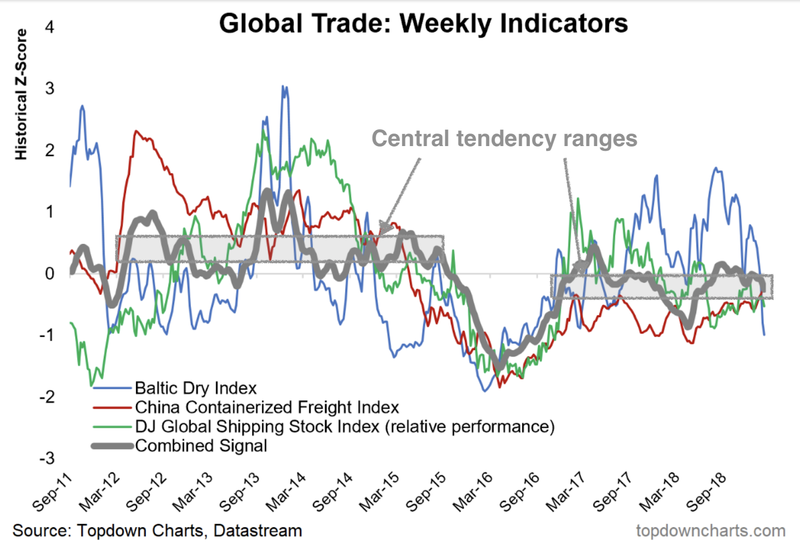 Source for the great chart (ex-my annotations): https://www.topdowncharts.com/. 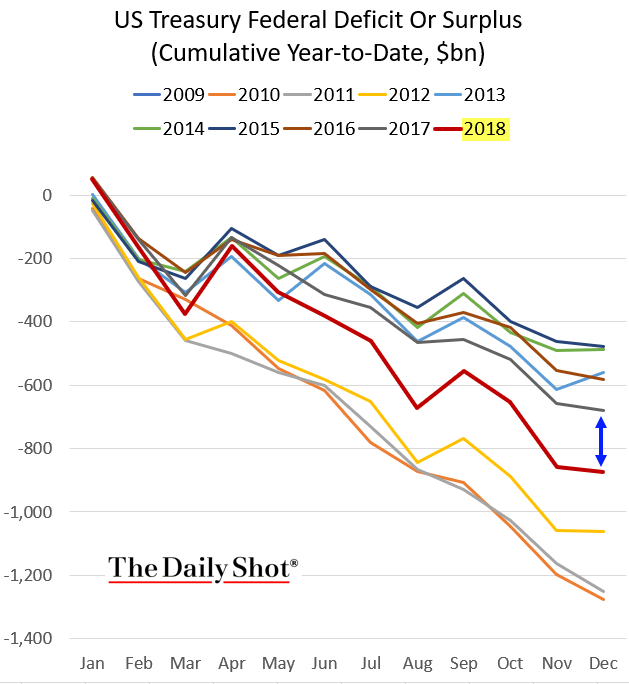 U.S. Federal deficit was up $192 billion y/y in December 2018. Nothing to worry about, as fiscal prudence has been the hallmark of the Republican party policies since... well... since some time back... That, plus think of what fiscal surplus will be once Mexico pays for the Wall, and Europeans pay for the Nato. 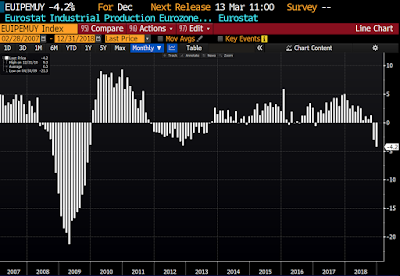 Based on the latest data through January 2019, Eurozone’s economic problems are getting worse. 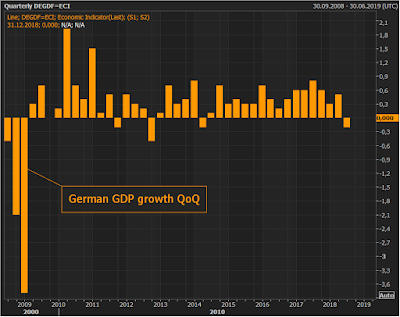 In 4Q 2018, Euro area posted real GDP growth of just 0,.2% q/q - matching the print for 3Q 2018. Meanwhile, inflation has fallen from 1.7% in December 2018 to 1.6% in January 2018. 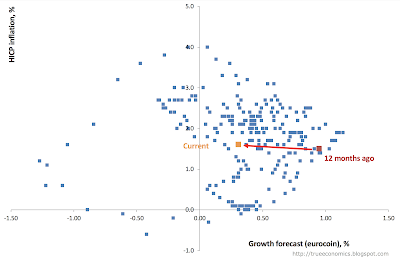 And Eurocoin - a leading growth indicator for euro area GDP expansion slipped from 0.42 in December 2018 to 0.31 in January 2019. This marked the third consecutive month of decline in Eurocoin, and the steepest fall in 8 months. Worse, July 23016 was the last time Eurocoin was at this level. 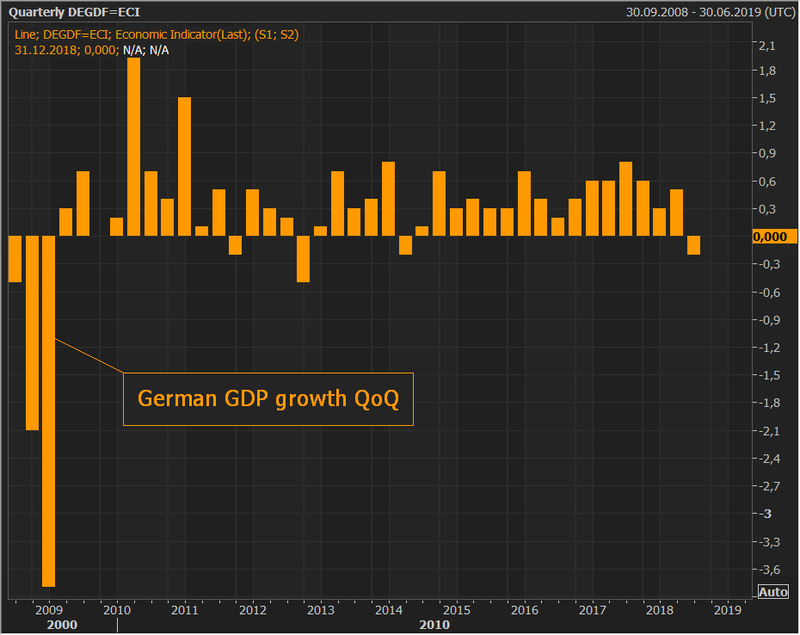 Within the last 12 months, Eurozone growth has officially fallen from 0,.7% q/q in 4Q 2017 to 0.2% in 4Q 2018, HICP effectively stayed the same, with inflation at 1.6% in January 2018 agains 1.5% in January 2018. And forward growth indicator has collapsed from 0.95 in January 2018 to 0.31 in January 2019. Euro area is heading backward when it comes to economic activity, fast. Italy is in official recession, with 3Q 2018 GDP growth of -0.1% followed by 4Q 2018 growth of -0.2%. 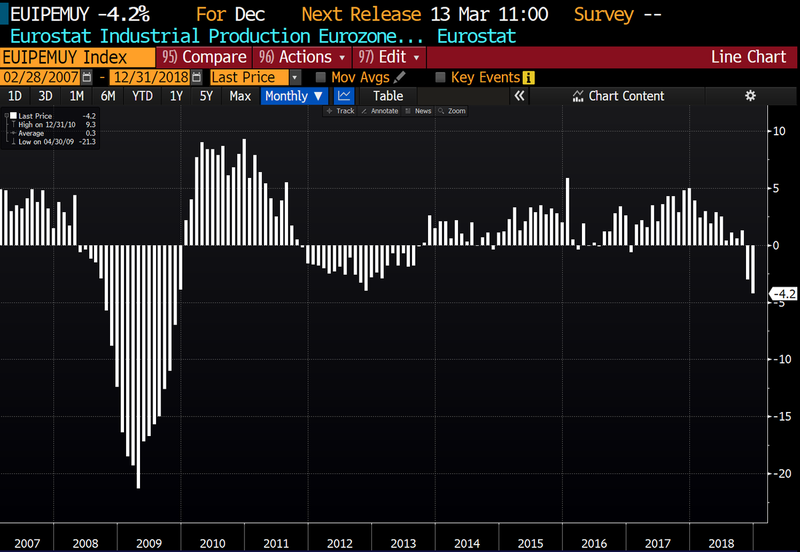 Industrial goods production is now down two consecutive months in the Euro area as a whole, with latest print for December 2018 sitting at - 4.2% decline, following a -3.0% y/y fall in November 2018. Worse, capital goods industrial production - a signal of forward capacity investment, is now down even more sharply: from -4.4% in November 2018 to -5.5% in December 2018.